In 1995, a movie paired Al Pacino and Robert De Niro for the first time since 1974's Godfather Part II. The publicists for Michael Mann’s Heat really pushed this angle and marketed the movie with a "when actors collide" angle. The ads also indicated that this became the first time the two actors appeared in on-screen together, which was technically correct. While Pacino and De Niro both starred in the second Godfather, that film told their stories independently and the two never crossed paths. Unfortunately, Heat didn't offer a ton of "interactive time" for the two. 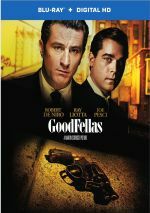 This occurs although the film intertwines the characters Pacino and De Niro play, as Pacino's Vincent spends the whole movie in pursuit of De Niro's Neil. Despite this plot, they spend very little time on screen together. There's one sequence in the middle of the film and one at the end, and that's it. Other than those ten minutes or so, the two never share a frame. Neil McCauley (De Niro) leads a gang of criminals. While they manage to lift more than $1 million in bearer bonds from an armored car, this comes with a price, as the heist goes violent and leads to the death of the guards. LAPD Lieutenant Vincent Hanna (Pacino) heads the investigation into the crime, and he learns that McCauley and company will soon attempt another robbery. Hanna and his cohorts attempt to stop this new heist and arrest the criminals. When I saw Heat during its theatrical run, I didn't much care for it. The expectations about the whole De Niro/Pacino thing, the great reviews – it all built the picture up too much and I just never connected to it. To be frank, I can't remember what exactly I didn't like about it, but I chalked it up as just another disappointing piece of work from Michael Mann. 1986’s Manhunter was okay, but I couldn't stand Last of the Mohicans. Though I didn’t like it in 1995, I'm happy I gave Heat another look on home video. The film's not perfect by any stretch of the imagination, but it's a good sight more exciting and provocative than I'd recalled from my initial screening. Of course, the acting gets most of the attention here, and most of that notice falls upon the two leads. Both are solid, although Pacino tends to fall back upon his “loud mode” too often, so he delivers too many of his lines in a hammy manner. On the other hand, De Niro offers one of his most understated performances. He doesn't rely on broad gestures or volume to deliver the strength of his character, and ultimately this makes him much more memorable and effective. It also nicely balances out the excessive bravado of Pacino. The supporting cast also deserves notice. The group also features notables like Val Kilmer, Tom Sizemore, Ashley Judd, Ted Levine, Jon Voight, Natalie Portman, and many others. That's a strong group, and while I can't really say that any member stands out, they make for a solid ensemble. As far as the movie itself goes, much of the fan focus sticks on the action scenes, and they definitely make a strong mark. However, what most impresses me is the emotional depth of the film. Outwardly, Heat seems to be little more than an exciting game of cops and robbers, but it really concerns itself with how the decisions we make affect our lives. These are extreme cases, since so many of them literally are life and death, but they nonetheless can be generalized toward those of us with less frightening - or exciting, depending on your interpretation - existences. Heat tries to posit the balances we have to make between our hearts and our heads, and how we deal with that. It's not the most exhaustive study you could want to see, but it's a surprise from this kind of a film, and it's very effective. Trivia note: Heat offers the only film to include both Ted Levine and Tom Noonan. Why care? Because Levine and Noonan played the villains in the first two Hannibal Lecter movies: Noonan was the “Tooth Fairy” in Manhunter, while Levine acted as “Buffalo Bill” in The Silence of the Lambs. Well, I think it’s interesting! 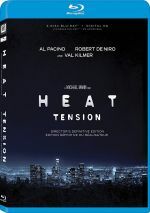 Heat appears in an aspect ratio of approximately 2.40:1 on this Blu-ray Disc. This turned into a strong presentation. For the most part, sharpness was positive. Some shots looked a bit soft, but those examples were infrequent. In addition, I felt most of them stemmed from the nature of the original photography, as Mann favored a style that tended to give the film a blown-out look that affected definition. Don’t expect real concerns, though, as the flick usually looked concise and accurate. I noticed no signs of jagged edges or shimmering, and edge haloes failed to appear. In addition, source defects created no distractions. The movie might be called Heat, but the color scheme went for a decidedly cool look. The flick favored a bluish-green tint that kept things subdued. The disc replicated the tones appropriately; the tones never came across as particularly rich, but they seemed satisfactory within the constraints of the visual design. Blacks were acceptably rich and deep, while shadows showed good definition. Again, the photographic style affected that side of things in a minor way, but I usually felt pleased by the low-light shots. Indeed, this was a dark movie but I thought the dimly lit scenes seemed surprisingly vivid. Overall, this was a “B+” presentation. I also thought the DTS-HD MA 5.1 soundtrack of Heat worked fine. With a few notable exceptions, the soundfield maintained an emphasis toward the front. Matters opened up well for the more action-oriented sequences, and those managed to create a decent sense of life. Otherwise, the mix favored the front, though not in an unsatisfying way. The film created a fairly natural feeling of environment and allowed for the various channels to add presence to the material. Most of the audio sounded good, as my only complaint came from the way the mix balanced dialogue. During a few scenes, I found it tough to hear the lines. Despite those periodic obstacles, speech otherwise sounded concise and distinctive. Music showed good range and definition, while effects were crisp and detailed. As I mentioned during my discussion of the soundfield, the track didn’t present a lot of opportunities to blast, but the audio kicked into gear well when necessary. Overall, this was a good mix. How did this 2017 Blu-ray compare with the original 2009 Blu-ray? Though the audio switched from Dolby TrueHD to DTS-HD MA, the end result seemed very similar, so I can’t claim I noticed any changes between the two tracks. As for the visuals, they also appeared virtually identical. Though the 2017 disc touts a “new restoration”, I felt the two versions looked awfully similar. The new image was slightly cleaner, but the old one lacked prominent flaws already, so there wasn’t much room for growth. The movie still looked/sounded very good, but it didn’t substantially improve on the prior release. The 2017 release duplicates the 2009 disc’s extras and adds new ones as well. We open with an audio commentary from Mann, as he provides a running, screen-specific chat. Don’t expect a firm focus on filmmaking here. As with Mann’s chat for Ali, he often prefers to discuss background and facts behind the flick. However, Mann balances things better here than during Ali, as he pulls back the curtain on a number of production elements. A moderate amount of dead air pops up during the track, and that makes it sputter at times. Nonetheless, much of the information Mann provides digs into matters well. He chats a lot about research and the facts behind the film. When he gets into aspects of the production, Mann tosses out some good nuggets. He delves into those issues more heavily during the flick’s second and third acts. We get notes about the actors and their approaches to their roles, some visual design choices, technical aspects of the shoot such as the camerawork in the big coffee shop scene, locations, and some storytelling issues. Mann starts to fade during the movie’s third act and often does little more than narrate the flick, but he presents enough good material to make this a worthwhile - if spotty - commentary. Next we go to a three-part documentary called The Making of Heat. Taken together, these segments run 59 minutes, 12 seconds and feature Mann, former Chicago police officer Chuck Adamson, author/Chicago historian Richard Lindberg, actor/former Chicago police officer Dennis Farina, LAPD technical advisor Tom Elfmont, first assistant director Michael Waxman, author Eddie Bunker, LA Sheriff’s Department technical advisor Rey Verdugo, producer Art Linson, second unit director Ami Canaan Mann, casting director Bonnie Timmerman, director of photography Dante Spinotti, executive producer Pieter Jan Brugge, technical weapons trainers Mick Gould and Andy McNab, sound mixer Chris Jenkins, production designer Neil Spisak, musician Moby, composer Elliot Goldenthal, and actors Al Pacino, Jon Voight, Robert De Niro (circa 1995), Val Kilmer, Dennis Haysbert, Tom Sizemore, Amy Brenneman, Mykelti Williamson, Tom Noonan, Ashley Judd, Danny Trejo and Diane Venora. 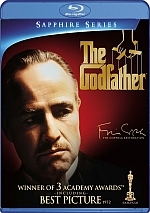 Called “True Crime”, the first segment covers the origins of the movie’s story and the reality behind it, research and preparation, and psychological elements of cops and crooks. In the next one, “Crime Stories” looks at Mann’s approach to the story and early stabs at it, casting and the characters, and thematic notions. Finally, “Into the Fire” discusses more about research and preparation, locations and the film’s depiction of Los Angeles, specifics of the shoot, audio, editing, and the score. Some of the information repeats from Mann’s commentary, and the show’s focus is the same. As with the commentary, we learn more about the facts behind the flick and preparation than we do the actual shoot, though some decent notes about that topic pop up here. Despite a little repetition and some of the usual generic praise, these programs offer a pretty solid look at the production. I’d still like more about the movie’s shoot, but these programs cover many interesting subjects and consistently entertain. Next comes the nine-minute, 58-second Pacino and De Niro: The Conversation. It presents notes from Voight, Brugge, Linson, Mann, De Niro, Pacino, Judd, Spinotti, Sizemore and film critic James Walcott. We hear about expectations for the movie’s most hyped sequence as well as character elements, story concerns, and actually shooting it. Some nice bits pop up here, but we’ve heard most of it elsewhere, so we don’t learn a lot. In addition, much of the featurette simply reruns the scene itself. It would’ve been much more interesting to get some unedited takes of the scene focused just on Pacino or De Niro; the old Criterion laserdisc for Se7en did that for a few Gwyneth Paltrow shots and it was fascinating. Another featurette pops up after this with Return to the Scene of the Crime. This 12-minute, five-second piece shows location manager Janice Polley and associate producer Gusmano Cesaretti as they head back to many of the sites used in the film. Additional notes come from locals Ted Halsey, Jayme Mazzochi and Lisa Glucksman. We watch this tour while they discuss the filmmakers’ collaboration with Mann and their work on the film as well as some facets of the locations. It’s an informative and cool examination of the various spots. In addition to three trailers, the disc includes 11 Deleted Scenes. These last a total of nine minutes, 44 seconds of footage. As you might infer, the brevity of the clips means that they don’t get time to show us much. Some of them simply extend existing bits, while others embellish secondary characters. The longest depicts what happened to the Trejo character. Most are fun to see, but none are terribly illuminating. New to the Blu-ray, we get two Filmmaker Panels. The first offers a 2016 Academy of Motion Picture Arts and Sciences discussion that lasts one hour, three minutes, 23 seconds. Moderated by filmmaker Christopher Nolan, it includes Mann, Pacino and De Niro for its first 26 minutes and then adds Brugge, Kilmer, Brenneman, Linson, Spinotti, Venora, Williamson, editor William Goldenberg and re-recording mixer Andy Nelson. For the second, we get a 2015 Toronto International Film Festival chat that goes for 30 minutes, 27 second. This one involves Mann on his own with moderator Jesse Wente. Across the panels, we get notes about story/characters, cast and performances, the scene that features both Pacino and De Niro, cinematography and visual design, sound design and music, sets and locations, and editing. Of the two, the AMPAS chat works best, and not just because it lasts longer. Nolan acts as a good moderator, and his status as an “A”-list director means he lacks the star-struck quality the occasionally impacts pieces like this. Though it can’t use all 12 of its participants in a wholly satisfying way, the AMPAS panel fares well. The TIFF discussion seems less satisfying, partly because of repetition. We hear stories and notes that we already found elsewhere, so we don’t get as much new content as I’d like. On its own, the chat seems fine, but it becomes less stimulating if you’ve already screened the rest of the supplements. Back in 1995, I didn't much care for Heat, but I better appreciate it now. I think it's a fairly involving and effective flick. The Blu-ray offers very good picture and sound plus an enjoyable and informative package of supplements. This becomes the strongest home video release of the film, though it probably doesn’t merit a “double dip” from fans who already own the 2009 Blu-ray.